We've seen some peculiar Nintendo titles over the years on its systems, including some that have only been released in Japan, but two new trademarks filed by the big N suggest that the crazy could be on the comeback. Japanese blog esuteru.com has noticed that Nintendo has registered two peculiar trademarks — Mysterious Pet: Legend of the Fish With A Human Face and Mysterious Partner: Legend of the Fish With A Human Face. With those titles being so unique, it looks like this is a revival of rumours that Dreamcast virtual pet game Seaman could make a return, with reports in 2012 suggesting a 3DS release. The original was the work of Yoot Saito, who was the developer of the Guild01 3DS eShop title Aero Porter; we know how popular that game's plane was. With that recent Level-5 collaboration on 3DS, it's not beyond the realms of possibility that Saito would work with Nintendo on a revival of this quirky pet sim franchise. We'll see if anything comes of these trademarks, but the image above should provide a nice teaser. I've heard of this game before but I still have no idea what the heck it is. 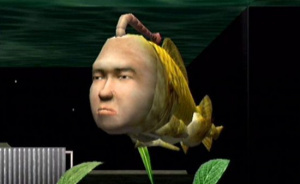 I loved Seaman on the dreamcast, I played that game alot, preferred it more then hey you Pikachu, if they make another one, than hopefully Leonard Nimoy can return to narrative the game. This better be in stores. The game's called Seaman, not Seamen. The latter sounds just...gross. Revive Star Fox ya bums! "Mysterious Partner: Legend of the Fish With A Human Face"
that has to be the weirdest videogame title of all time. Here's hoping for a Leonard Nimoy reprise. I own this game for my dreamcast and although the required time and patience is a little harder to provide in today's world, in the early 2000's this was a really weird and fun title. Think of it as a digital, sassy furby that is convinced you're gay. I'm not even kidding. Revengers of Vengeance on the (Mega CD) has to be the weirdest video game title of all time. What in the name of English grammar is this name supposed to mean? It hasn't even got the excuse of being a dodgy Japanese translation, since it was simply called Battle Fantasy there. Well, the gamepad would be funny as a... seaman... tank, it has the mic, and the camera could be used nicely. I'd get it. I rather d̤̥̭͖̪͔̬i̲̘̦̤̭̯̥s̪̮͖͍͔̳̹s͎̥͇̦͍̗͚e̬̻̫̦̺͎̠̯c̫͓̝̦͚t̯̪̱̘͚̭̜ one to see what makes this creature so unique. Because every gamer needs more pirates in their gaming diet! I can see this being a great success for Nintendo. I could see this as a raucous DL 3DS game that would go over really well w/ the Annoying Orange (don't know how that ever became a tv show, but it is) and Dinosaur Office crowd, but no way no how do I want that fish-guy on my big tv screen. I'd get it. I loved it on the Dreamcast and am always happy to get games that are refreshing and unique from all the first person shooters and sports games out there. I'll never forget turning Seaman back on after about a day and a half, with the water all brown and murky and my Seaman floating at the top of the tank. There was no message; no "return to the main menu" option, just the icy temperature gauge and the bubbling death water. I also felt like a huge douche talking to the Seaman alone in my room at night. Speaking to video games is always uncomfortable and weird. It's why having to say "Xbox on" is one of the Xbone's worst "features". Come one there are better games on Dreamcast that you can make a sequel too. Maybe like Shenmue. Loved the original.. I wish I still had my dreamcast to fire it up and see what he's been doing for the last 13 years. You people do realize that there already had been a sequel to this on the PS2 excklusively in Japan, right? From the comments here it seems like people consider this to be the first sequel. @EarthboundBenjy I've played this game to bits on my Dreamcast but it does require quite a bit of patience, as was mentioned in the IGN review mentioned in one of the previous comments, so I do wonder if it would get a positive response in today's game scene. There's a guy on YouTube called Brett Darien that has uploaded quite a few videos of his personal experiences with the game, so if you want to learn more about the game and how it 'reacts' to you then they are a good information source. @siddyp00h well Sega isn't doing anything with the DreamCast that's for sure. And when a company isn't using something, it all goes to Nintendo. Just look at the Wii VC collection. If Microsoft or Sony falls down at some point, you can bet your buns that their old games are likely to end up on the VC. Well........I guess that's what happens when you rush to post something in the morning, since well.........I had work early in the morning. @Edit Thank you, you're my new best friend. And also @Drop-Dead-Fred Yes, of course, I am a legend. Anyway.......Seaman was good on the Dreamcast, hope this comes to the 3DS/Wii U, ok there, have a nice day everyone. @FishieFish I see you're a fan of fish. If Nimoy won't do it, get Shatner. NINTENDO NOW BRING SHENMUE HD!!!! Always enjoyed asking him about Dolphin. @Ryo_Hazuki-san they should definitely bring Shenmue HD to the west, that would be AWESOME!!! There's a sequel on the PS2, JPN-only. It's very similar. This was also a Sega franchise, right? Just like Bayonetta! If Nintendo did buy this franchise, I wonder how many other Sega franchises Nintendo owns now! Who knows what the future holds!